Often, when I meet people and tell them that I live a raw food lifestyle, they ask me two questions. One is where I get my protein from and the other is whether it is very restrictive. The simple answer of course is that there is plenty of protein in a plant based diet and given that there are around 80,000 plants in the world that are edible for humans, you could eat something different every day for many years to come. 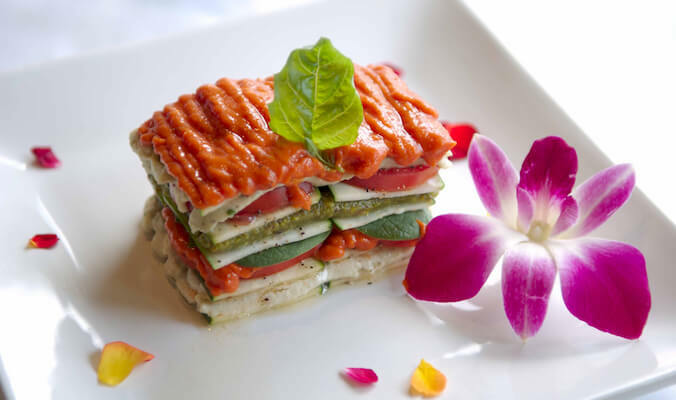 Raw, plant-based food is nutritious, colorful and delicious. Plant-based food is full of antioxidants, phytochemicals, vitamins, minerals, healthy fats and fibre and is designed to optimize health and vitality. It is a way of living that is naturally anti-inflammatory. This is significant because inflammation is now widely considered to be one of the main underlying causes of most modern day diseases. It is also immune boosting, and causes the least amount of free radicals, the uncharged molecules that attack healthy cells. The vibrant colours in plants come from phytonutrients. Phytonutrients, also called phytochemicals and antioxidants, are the most important defenders against cancer and other illnesses. This informs us that the more we eat a wide range of colours through vegetables, fruit, nuts, seeds and seaweeds, the wider a range of phytonutrients we make available to our bodies to promote health. Unfortunately most of the phytonutrients (up to 90%), vitamins and minerals are destroyed when cooking foods. Proteins become altered in a way that makes them less useful to the body. But most importantly, cooking destroys enzymes, and enzymes are necessary for every function in the body, including brain function. Why do we call it a lifestyle? Because most diets rely on being restrictive in some way. That means restricting calories or carbohydrates, eating on some days and not others, when to eat, what to eat with what, etc. Meals have to be calculated, which frankly takes the fun out of eating. Raw food is not restrictive at all. True, if you’re like me and live a 95% raw lifestyle, it doesn’t include animal proteins or glutenous grains. But even just making 50% of your daily food intake raw, a plant-based diet will give you more energy, create youthful vitality, help you achieve your ideal weight and will improve the healing mechanisms in your body. A raw food lifestyle gives you freedom from counting calories, measuring portions and craving foods you shouldn’t have. It is fun and satisfying; what I treasure most about it, is that it goes way beyond a diet, as it improves every area in your life to be full of joy and wellness.